My son loves trains. So I came up with a train related twist to an inspection of the periodic table. We sat and cut up a copy of the table and then rearranged each element as a ‘station’ on an underground rail system. Each line represents a characteristic shared by the elements on that line. After (quite) a few drafts, and more time than I care to admit, we ended up with this. It was constructed with the help of Metro Map Creator (no way I could have done it without this neat web app). If anyone fancies building some more lines I’ll happily send you the saved file (share using a creative commons attribution, non-commercial, share a like license) . Thanks to Shaun, Max, Ian, Mitch, Yul, Labrat and Stu (alway handy to have a Nature Chemistry editor check your work) for spotting some mistakes. All corrected now. Now on version 1.4. New line added, to show elements that were discovered via synthesis and then found in nature. Awesome, but Technetium has no stable isotope as well. Tweeps have also pointed out typos in Cesium and Vanadium. I’ll sort them out later. Very awesome. Has it helped your son learn the elements? (My son loves trains too so I should love to get a copy). Feel free to print out a copy. Once I’m sure I’ve got all the clinches ironed out I’ll post a high res copy for people to print. Yes my son did learn something about the elements. Mainly via the process of compiling the map, and now he wants to take it into school to show his class mates. So I think its achieved its objective. Lanthanoids is misspelled ‘Lantanoids’. Furthermore, they and their cousins are usually referred to as Lanthanides and Actinides, but either is acceptable. This might work well as a board game. Thanks Max, sorted now. Glad to see peer review is working well here! Mitch, what spotting my mistakes 🙂 God knows there’s enough of them. Dyslexics of the world untie! Sure, the more dorm rooms with a copy of it the better. Great job with the map. My only nitpicking would be to pit Bismuth one stop up on the “no stable isotopes” metro line. Good point, will do. Although with a half life a billion times the age of the Universe it might have to have a unique branch line. This is a great idea! Very very cool. Can you please send me a copy? This is awesome! Thank you! 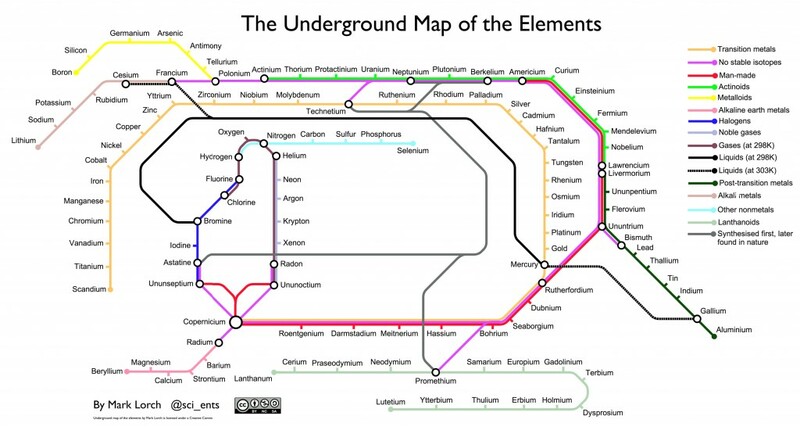 My son is a chemistry AND subway map nerd and would love to play around with your saved file. Can you please send it? He’ll need to copy and past it into the Metro Map Creator.